In the following, the results of the studies of the efficiency of riparian buffers carried out in the Porijogi River basin and the Viiratsi area, which is heavily loaded with pig slurry application, both of which are located in south Estonia, will be highlighted. For the intensive field studies in 1994-98, two transects were established on the thalwegs of slopes adjacent to streams and crossing differ ent riparian plant communities. Transects had similar biophysical conditions with similar plant communities, covering fields, grasses, wet meadows, and woodlands. The Porijogi transect is situated in the central part of the Porijogi catchment with lower pollution load, where agri cultural activities ended in 1992 (Figure 15). The Viiratsi transect is situated in an area impacted by pig slurry from the Viiratsi pig farm (Figure 16). In the landscape profiles, piezometers (three rows in the Porijogi transect and four rows in the Viiratsi site, with three replicates in each row) and study plots were established on the boundaries between plant communities. Shallow groundwater (the depth of the water table is 50-150 cm from the surface) samples from upper aquifer were collected once to twice a month from piezometers installed on the borders of plant communities. Three piezometers were installed in a 20 (Porijogi) to 30 (Viiratsi) meter wide zone on the borders of riparian communities. The depth of ground water var ied 1-2 m in the field sampling points and 10-80 cm in riparian communities. Filtered water samples were ana lyzed for NH4 + N, NO2 N, NO3 N, total Kjeldahl N, PO4 3 P, total P, SO4 2 , Fe, and Ca2+. Groundwater discharge was estimated on the basis of both Darcy's law and by gauging with weirs installed in groundwater seep ing sites. Average annual input discharge in 1994-95 was estimated at 8.3 ± 3.5 m3 ha Jd 1 in Viiratsi and 8.0 ± 3.2 m3 ha 1 d 1 in the Porijogi test area. Two meth ods were used for the measurement of denitrification in the Porijogi alder stand - the 'closed chamber method' and the HeO method - allowing the estimation of the form of emission of N. For the estimation of denitrification flux in Viiratsi, previous denitrification estimates based on the acetylene method were used. Soil samples of 50 cm were taken in October 1994-98 in three sets and at two depths (0-10 and 10-20 cm) from all plant communities in toposequence through the ripar ian buffer zones (Figures 15 and 16). Sampling was carried out twice a year: in spring (May) and autumn (October). A hand held 4 cm diameter corer was used to collect samples. Soil pH value, organic matter (loss of ignition), and Kjeldahl N and lactate soluble P concen trations were analyzed using standard methods. Porijogi and Viiratsi, respectively, were excavated and divided into five fractions: stump; coarse roots: d > 20 mm, 5 mm < d<20mm, 2 mm < d< 5 mm; and fine roots (d<2mm). Nodule biomass (kgha J) was esti mated separately in June and July 1995. The dry mass of all tree components was measured, and N and P concentrations were analyzed. Block digestion and steam distillation methods were used to test the plant material for Kjeldahl N concentration (Tecator AN 300). The shallow groundwater nitrogen load in two transects differed. The total N concentration in the Viiratsi transect reached 138 mg l 1 in the cultivated field after slurry application. In the Porijogi transect, the highest total N concentration was only 19.5 mg l . There was a consider able decrease in N concentration in the shallow groundwater throughout the Viiratsi transect buffer zone. 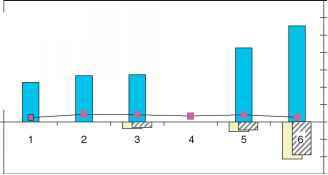 The average total N in water decreased from 23mgl 1 in the field to 3.1 mgl 1 at the end of the buffer zone (Figure 16). 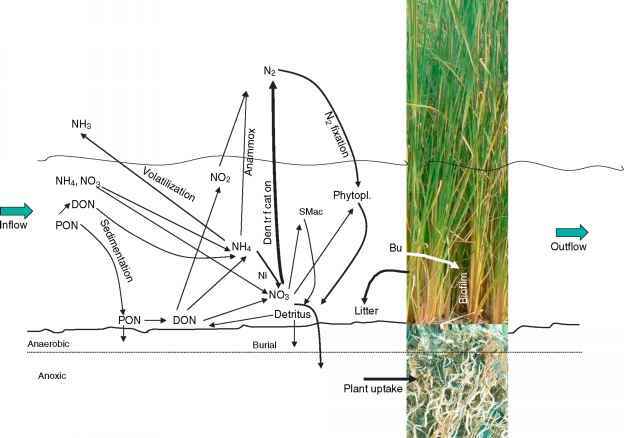 In the 5 m wide grass community in Viiratsi, the average total N concentration in water decreased from 23 to 14.3 mgl and in the following 11 m wide wet grass community, to 5.6 mgl 1 In the alder forest zone, the total N concentration in water decreased to 3.1 mgl 1. 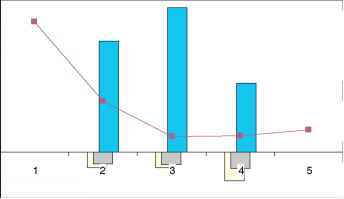 This change from point 2 is highly significant (p < 0.01) compared to the values at points 4 and 5. The change was also highly significant when com paring points 3 and 4 and 3 and 5. Similar to total N, we found a significant decrease in total P concentration in shallow groundwater throughout the Viiratsi transect. In the field, the concentration was 0.43 mgP l 1 (Figure 16). From 0.17 mgP l 1 at the field edge, the P concentration dropped to 0.05-0.07mgPl 1 in the riparian wet meadow and alder forest. 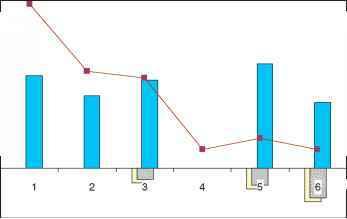 In the less polluted site in Porijogi, there was also a significant decrease in P concentration: from 0.49 mg P l 1 in the field (Figure 15) to 0.27-0.29 mgPl 1 in abandoned grassland and to 0.05-0.08 mgP l 1 in the Filipendula ulmaria-Aegopodium podagraria meadow and alder forest. In winter and spring, we were unable to register remarkable increases in either N and P input by lateral groundwater/surface runoff to the system. This basi cally has to do with the changing climatic pattern in southern Estonia, where no significant snowmelt peaks were formed in rivers during the last decade. Basically, these dynamics of N and P concentrations in ground water fits well with other authors' results and results modeled by REMM (Figure 8). Figure 15 Annual nitrogen (above) and phosphorus (below) demand (gm 2), average annual N and P concentration in shallow groundwater (mg l 1), and average N and P concentration in soil (mgkg 1) in the Porijogi study transect. Numbers 1-6 indicate shallow groundwater, soil, and phytomass sampling plots. Adapted from Kuusemets V, Mander 0, Lohmus K, and Ivask M (2001) Nitrogen and phosphorus variation in shallow groundwater and assimilation in plants in complex riparian buffer zones. Water Science and Technology 44(11-12): 615-622, and Mander 0, Hayakawa Y, and Kuusemets V (2005) Purification processes, ecological functions, planning and design of reparian buffer zones in agricultural watersheds. Ecological Engineering 24(5): 421-432. Figure 16 Annual nitrogen (above) and phosphorus (below) demand (gm 2), average annual N and P concentration in shallow groundwater (mgl 1), and average N and P concentration in soil (mgkg 1) in the Viiratsi study transect. Numbers 1-5 indicate shallow groundwater, soil, and phytomass sampling plots. Adapted from Kuusemets V, Mander U, Lohmus K, and Ivask M (2001) Nitrogen and phosphorus variation in shallow groundwater and assimilation in plants in complex riparian buffer zones. Water Science and Technology 44(11-12): 615-622, and Mander U, Hayakawa Y, and Kuusemets V (2005) Purification processes, ecological functions, planning and design of reparian buffer zones in agricultural watersheds. Ecological Engineering 24(5): 421-432.
trees was only 2.27 gPm 2yr 1. In the Porijogi transect, the assimilation of N was also highest in the gray alder stand (28.5 gNm 2yr 1). In the F.ulmariaassociation (Figure 15), the demand ofN was estimated to be as high as 21.3 gN m 2 year 1. Similarly to the Viiratsi test area, P demand was highest in the meadow with F.and A.podagraria association (3.1 g P m 2 yr 1), whereas in the gray alder stand it was 1.94 g P m 2 yr 1. These results clearly demonstrate the benefits of com plex buffer zones consisting of several vegetation types. Similarly, other researchers have found that the combina tion of forest stands with grass strips or the combination of a riparian wetland with a forest buffer strip can signifi cantly increase buffering efficiency, especially in the area of P retention. 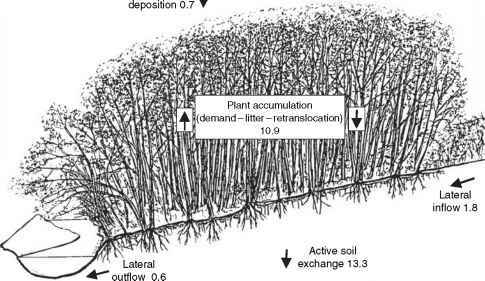 Nutrient concentrations in soil increase in both wet meadow and gray alder riparian communities. 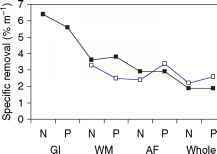 The N concentration in the Viiratsi topsoil layer (0-10 cm) increased from 2.16 to 9.87mgg 1 (Figure 16). 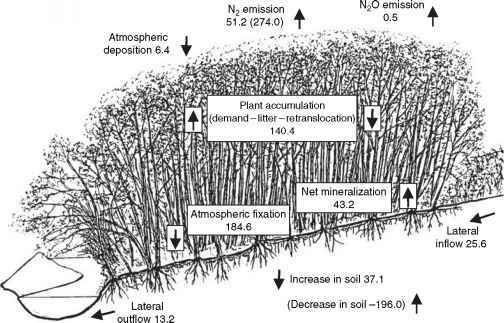 In the Porijogi transect, the increase of N in topsoil was from 2.02 to 10.74mgg 1 (Figure 15). The highest values of both N and P were observed in the gray alder stands (9.87 and10.74mgNg 1, and 0.94 and 1.02 mgP g 1 in Viiratsi and Porijogi, respectively; Figure 16, sampling point 4, and Figure 15, sampling point 6). This is due to the high immobilization ofnitrogen and phosphorus in soil organic matter and microbes. Figure 17 Removal efficiency (%), specific removal (% m 1), and retention (mass removal; kg ha 1 yr 1) of nitrogen and phosphorus in test sites. 1 - Porijogi, 2 - Viiratsi. Gl - Elytrigia-grassland strip, WM - wet meadow (F. ulmaria-Cirsium oleraceum-A. podagraria), AF - alder forest, whole - complex buffer as a whole. Adapted from Mander U, Hayakawa Y, and Kuusemets V (2005) Purification processes, ecological functions, planning and design of reparian buffer zones in agricultural watersheds. Ecological Engineering 24(5): 421-432. Figure 18 Nitrogen budget (kg ha 1 yr 1) in the Porijogi gray alder forest in 1995. The numbers in brackets indicate estimated values based on denitrification measures from 2001 to 2002. Based on Mander U, Hayakawa Y, and Kuusemets V (2005) Purification processes, ecological functions, planning and design of reparian buffer zones in agricultural watersheds. Ecological Engineering 24(5): 421-432.
the concentrations of soil water were very low (0.068 mgl J) for such a heavily polluted area and were comparable with outflow from the less polluted Porijogi river transect (0.055 mgl J). The increase of phosphorus in the lower part of the buffer zone may be the result of saturation in the buffer zone. The nitrogen budget of the gray alder forest in 1995 is shown in Figure 18. Due to the cessation of agricultural activities in the upslope agricultural fields in 1992, the lateral inflow of N by groundwater and overland flow has decreased to the level of 25.6kgNha 1 yr \ A few investigations from 2002 suggest that the decrease has continued. The same is valid for the outflow, which was 13.2kgNha 1 yr 1 in 1995. N2 emission has increased from 51.2 in 1995 to 274 kgN ha 1 yr 1 in 2002. This change, which resulted in a significant decrease in the soil N pool (from 37.1 to —196kgNha 1 yr 1; Figure 5), can be explained by forest succession and a relevant change in bacterial communities. The atmospheric deposition (6.4 kgNha 1 yr 1), plant accumulation (N demand - litter accumulation - retranslocation; 140.4 kgN ha 1yr 1), net mineralization (43.2 kgNha 1 yr 1), and the N2O emission (0.5 kg N ha 1 year 1) remained stable. The very high N2 flux in Porijogi (Estonian study site; 509kgha 1 yr 1), which began only 2 years ago, remains an exciting problem. This is probably related to the succession of the 18 year old forest growth and changes in the microbiological conditions of the soil, and also to the fact that since the middle of the 1990s the system has received significantly less lateral nitrogen inflow via groundwater and overland flow than in the 1980s and ear lier periods. Conclusively, the potential of riparian buffer zones to act as trace gas sources remains largely unknown and needs much more attention in future investigations. We assume that the intensity of N2 fixation (184.6 kgN ha yr ) has been decreasing due to the low number of nodules found in 2002. However, these data are preliminary and the measurements of N2 fluxes must be continued in order to obtain more evidence ofsignificantly increasing emission and decreasing fixation values. Phosphorus inflow to the gray alder stand is 3 times higher than outflow: 1.8 and 0.6 kgP ha 1 yr \ respectively (Figure 19). Presumably the P adsorbed by forest soil and immobilized in bacteria is supported by lower outflow values and a relatively high soil exchange value (13.3kgPha Jyr J). In contrast to other riparian trees, a lot of P is accumulated by alders (10.9 kgP ha Jyr J). Probably this high value of accumulation will not remain in the late succession stages of the gray alder community. On the other hand, the P budget is assumed to be more stable than the N budget. Figure 19 Phosphorus budget (kg ha 1 yr 1) in the Porijogi gray alder forest in 1995. Based on Mander U, Hayakawa Y, and Kuusemets V (2005) Purification processes, ecological functions, planning and design of reparian buffer zones in agricultural watersheds. Ecological Engineering 24(5): 421-432. See also: Constructed Wetlands, Surface Flow; Stream Restoration.